August 29, 1920 Charles “Bird” Parker, Jr., jazz saxophonist and composer, was born in Kansas City, Kansas. Parker began playing the saxophone at age 11 and by 1938 was touring nightclubs and other venues in the southwest. In 1939, Parker moved to New York City where on November 26, 1945 he led a recording session for the Savoy label, marketed as the “greatest jazz session ever”. During his career, Parker played a leading role in the development of bebop and his innovative approaches exercised enormous influence on his contemporaries. Parker died March 12, 1955. The coroner who performed the autopsy mistakenly estimated Parker’s 34 year old body to be between 50 and 60 years of age. 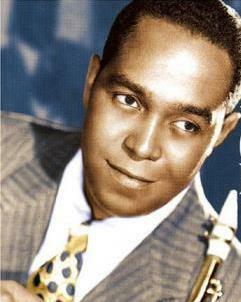 In 1979, Parker was posthumously inducted into the Big Band Hall of Fame, in 1984 he was honored with a Grammy Lifetime Achievement Award, in 1995 the United States Postal Service issued a commemorative postage stamp in his honor and in 2002 the Library of Congress honored his recording “Ko-Ko” (1945) by adding it to the National Recording Registry. Four of his recordings have been inducted into the Grammy Hall of Fame as having “qualitative or historical significance”. A number of biographies have been written about Parker and in 1988 a biographical film, “Bird”, was released. A memorial to Parker, featuring a 10 foot tall bronze head, is located in Kansas City near the American Jazz Museum.